November 4th. DuPage County. The networks call the election for Barack Obama in an Electoral College landslide. Seconds after the announcement, DuPage's suicide hotline is flooded with calls. Residential neighborhoods light up with gunfire as residents shoot at each other's yard signs. 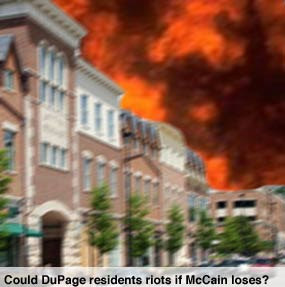 Thirty minutes after the announcement, fires breakout in downtown Naperville as Palin supporters riot. Three hours later, Governor Blagojevich declares martial law to "preserve the ballots." Two weeks later, a National Guard commander calls for a surge of troops to restore order. The stock market plunges, as the richest county in America becomes a war zone. DuPage county officials are working around the clock to prevent this disaster should Sen. Obama win the Presidential Election. "To be honest, we were preparing for rioters from Cook County moving into our county following a McCain victory." Said David Wegiel, spokesperson for the DuPage government. "But now that an Obama victory is a real possibility, we've had to change our plans." Still, Wegiel says the county will be ready in case Obama wins. Donna Winthrop, head of DuPage's suicide prevention network, says that they will have extra phone counselors on election night. "We expect some phone calls from McCain supporters, but we're really concerned about Republicans suffering from 'Obama guilt.' These are life-long Republicans whom for whatever reason, decided to support Obama. They may have second thoughts on Election Day, and some may feel guilty for abandoning their party." Winthrop says that their councilors are prepared for these kinds of calls. "We'll tell them that in the past, Democrats have voted for Republicans, and that they are free to vote for whatever party they want to. Plus if they stay alive, they can work to improve the Republican Party so they can vote for them again. We also will assure them the Republican Party isn't going away, and Obama will have to deal with them eventually. Basically we'll tell them to hold on, and things will get better." As for riots, Donald Homes of the DuPage Law Enforcement Coordination Committee, says the police will be ready. "Our officers voted early, so on election night, we'll be keeping an eye on the neighborhoods. We'll keep an eye on strange people walking around in our neighborhoods, and if we receive reports of inappropriate voters at a voting station, we will be there in force. Oh, and make sure you've paid your parking tickets, and don't forget to show up on the first Wednesday of the month to vote!" Naperville Mayor George Pradel told The Babbler that he has no fears about riots in Naperville, no matter who wins the election. "Come on!" Said Pradel. "This is Naperville. We don't riot! We have an image to uphold! If McCain loses, we'll cry on election night, and then donate money to the Republicans the next day. Riots. You guys are funny. I understand why Roger hasn't shutdown your publication." The DuPage Democratic Party could not be reached for comment. Sources: Owens demands trade to The Bears!